When your flag is easily associated with cinematic scumbags, it might be time to pack it up. The Confederate flag has had a rough run of it lately. Before we get into it, I know the current subject of our debate isn't the *real* flag of the Confederate States of America (nor is it technically the "Stars and Bars") but actually the Battle Flag of the Army of Northern Virginia. It doesn't matter. The original CSA flag wasn't the one hoisted over Southern state houses as a middle finger to Brown v Board of Education and the Civil Rights Act and, not coincidentally, isn't the one currently adorning F-150s and oversized belt buckles across Dixie. Walmart, eBay, and Amazon, in response to mounting public sentiment against the flag, are three of the largest in a growing list of stores that will no longer sell Confederate merchandise. It also looks increasingly likely the state of South Carolina — and possibly others — will be removing the flag from government buildings. This is good news for everybody. The left can be happy, because an enduring symbol of racist history looks like it's finally on the outs, while the right can once again trust in the sure hand of the market. Even Kid Rock has reduced his rebel-related gear to a pair of flip-flops. So much social upheaval. Take it away, Klaus! I don't know what these sweeping changes mean for the flag in movies and TV. Wholesale disappearance is unlikely, especially since It's such a fine signifier of villainy, as we'll see. Still, what better time to indulge in a little racist retrospective? This is by no means a comprehensive review. I'm ignoring music, which is a post in and of itself. Also, we're talking about movies set in more or less contemporary times, not Westerns or films where the presence of a Civil War flag might make sense (Gettysburg, The Horse Soldiers, Freebird... The Movie). Quentin Tarantino doesn't compose his scenes haphazardly, so the placement of the flag inside Maynard's pawn shop (see header pic) can hardly be an accident. It also adds an extra dimension of unpleasantness to the subsequent events in the basement, as well as increased satisfaction at Maynard and Zed's comeuppance. The flag is also visible in the Simpsons spoof of the scene in "22 Short Films About Springfield." Because that wasn't creepy or anything. You'll have to trust me on this, since my hazy recollection of bad guy Joe Wade (Scott Glenn) driving a Jeep with the flag on it isn't even on YouTube. 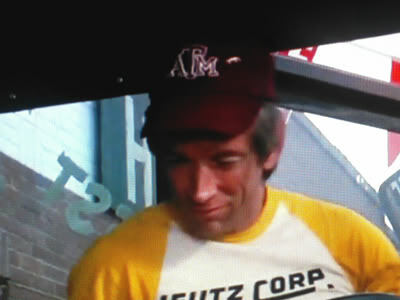 He also wore a Texas A&M baseball cap, and it wll never not be funny to me that those were the two ways the filmmakers chose to demonstrate his villainy. Leave it to Godfather of Gore Herschell Gordon Lewis to make a splatter version of Brigadoon. Only in this case, the folks who appear every century do so to wreak bloody revenge on the forces of Northern Aggression. Well, Yankee tourists, anyway. General Sherman died in 1891. But, but, they're just good old boys, right? Never meaning no harm? My memories of the TV show are pretty benign, but being 11 years old I wasn't much of an expert on the nuances of Southern history. Still, naming your car the "General Lee" could certainly be looked at as ... problematic. And to be fair, the 2005 movie made a half-assed attempt to address the issue (fast forward to the 3:45 mark). Warner Bros is apparently also removing the flag from the roof of the General Lee (now, about calling it the "General Lee"...). At least Daisy (both iterations), had the courtesy not to sport the Confederate flag bikini, but more on that later. I don't know if you can come up with a more despicable combination than "white supremacist rapists." Unless maybe they also ran a dog fighting ring. Which I'm sure they totally did. On the plus side, at least he supports legalized marijuana. Boyhood (2014) - It's a throwaway scene, the flag backstopping a man who tells Mason and his family — who are canvassing for Obama — he won't be voting for "Barack Hussein Obama." Like "Hussein" is somehow more embarrassing than "Milhouse." Or "Gamaliel." Shag (1989) - Does the Rebel flag count if it's in bikini form? Yes. Yes it does. In fact, there's probably an entire sub-category to be included here, but this is a family blog. Just trust me when I say that's one Google search you don't want to do at work. I'll just stick with the earliest known sighting: Bridget Fonda. The bikini scene comes later in the movie, but first she practices with the flag in a routine that'll really make your Bull Run. To its credit, NASCAR hasn't allowed the flag on any of its official merchandise in quite some time. That does't keep it from cropping up repeatedly in crowd scenes in the movie (like during the Daytona 500). I just realized I've never watched this in its entirety. We rented it on a trip to the river many years ago and were so bored we all opted to take a nap instead. In that sense, it was a pretty accurate portrayal of the "excitement" of stock car racing. So long, Confederate flag, and good riddance. You had a good run, if by "good run" you mean a lost war and 50 years of association with the KKK and Charlie Daniels. We'll be in touch if Hollywood needs a new Civil War epic, or when the Flying J in Gulfport runs out of bandanas.